ΟΙ ΘΕΣΕΙΣ ΚΑΛΥΦΤΗΚΑΝ. ΕΥΧΑΡΙΣΤΟΥΜΕ ΠΟΛΥ ΓΙΑ ΤΟ ΑΥΞΗΜΕΝΟ ΕΝΔΙΑΦΕΡΟΝ. Ένα συναρπαστικό ταξίδι στην μετάβαση, μια επαφή με δημιουργικούς ανθρώπους που δουλεύουν για έναν άλλο κόσμο εδώ και τώρα, μια γνωριμία με την φύση στην περιοχή των Πυρηναίων στην νοτιο-δυτική Γαλλία... και άλλα πολλά! Η οργάνωση μας αναζητάει νέους και νέες από 18 μέχρι 25 ετών για να συμμετάσχουν στην εγκεκριμένη ανταλλαγή νέων ,που περιγράφεται παρακάτω με λεπτομέρεια, στην Γαλλία από 06 μέχρι 27 Αυγούστου 2013. Η ανταλλαγή νέων πραγματοποιείται στα πλαίσια του ευρωπαϊκού προγράμματος "Νεολαία σε Δράση" και καλύπτει όλα τα έξοδα διαμονής και διατροφής καθώς και το 70% των αεροπορικών εισιτηρίων των συμμετεχόντων. Διαβάστε παρακάτω και αν ενδιαφέρεστε στείλτε άμεσα email στο [email protected] με θέμα: Ανταλλαγή Νέων 'trip to HETEROTOPIA'. Εναλλακτικά κατεβάστε το pdf αρχείο πατώντας ΕΔΩ. In 2013, discover the « Heterotopias » of Midi-Pyrénées (South-west of France), places where women and men work to create another world. Via Brachy is a NGO that contributes to link organisations and people of diverse origins around the world. We promote intercultural actions and trades in France and abroad with following means: solidarity tourism, intercultural exchange, educational coaching and training. Since 2003 our main project is an itinerant caravan in Western Africa. With this activity we deal with the issues of cultural exchange, international solidarity and self-training. With our different partners in the South we share our experience, our know-how and we promote social awareness on renewable energies and environmental preservation. Since 2011, we also offer specialised courses and support for managers of local and international solidarity projects (project management, journey preparation and intercultural exchanges, etc.). In 2013, we decided to explore the Midi-Pyrénées region (South-West of France) with the Caravan “On the path of Transition”. We want to discover those places where women and men show with their work that another world is possible. The “Trip to heterotopia” is an opportunity to go to those places and to meet the citizens that lead them. To dream our life or to live our dreams? Although inequalities are increasing all around the world and if human rights are still flouted in (too) many places, change is starting. The multiple crises (economic, social, ecologic…) we go through and the new communication and information technologies give strength to this simple (but revolutionary!) idea that the inhabitants of the planet Earth have a common destiny. This change of paradigm driven by a new vision of the world is not shared by all and some persons experience identity regression or self-absorption, but an increasing number of citizens are involved in searching new solutions for fundamental problems (climate change, food sovereignty, etc.). The sustainable and liveable world that we are hoping for is carried by ideas and values that come true here and there through different projects. Utopias aren’t sweet dreams anymore. They’re becoming facts. Heterotopia refers to these achieved utopias and social innovations brought by citizens. With the “Caravan On the path to Transition”, and especially with the “Trip to Heterotopia”, we want to deal with social innovation with citizens from our area and from other European Union and neighbouring countries. This project is a research made through action, with learning courses (to think), periods of information (to say) and actions in the field (to make). We hope to encourage social innovation and transformation and to contribute to public awareness about transition movement. 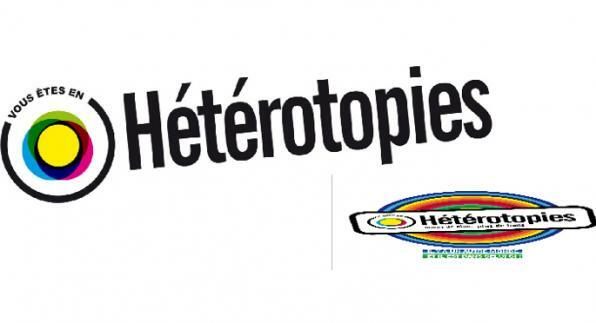 Did you say «Heterotopies	»? « Heterotopia » is a concept that was suggested by a French philosopher (Michel Foucault). He used this term to talk about utopias that become a reality, those we can see, touch and criticize, here and now. These places are filled with imaginary that is being transformed into a real state. Heterotopias arise in reaction to an individualistic and consumerist world. They allow us to see another path: the path of Transition. Some question our way of living, our education, our health, our trading, our working or financial system, others invent new ways of seeking and defining Arts and Culture, some are changing our social labels and propose another social organization, etc. There are as many ways of doing that there are Heterotopias. Each citizen, each group, is creating projects according to the area and the people. But the values and principals the Heterotopias are based on are the same. All those initiatives are based on humanistic values of solidarity, justice and fraternity. They are creative and inventive, they are collective experiences that are in perpetual (r)evolution. You can find them everywhere. Most of us know some. But we don’t easily see them, even if we’re interested in. That’s why we decided to highlight them. All around us citizens are acting to ensure that all of us can have access to culture, healthy food, health and knowledge... They are experimenting other ways to live, cooperate, exchange, innovate. They are transforming our cities and countryside. With the “Trip to Heterotopia” we wish to go and see how they manage. 24 travellers: 8 young adults [18-25 years] from Midi-Pyrénées; 8 young Greeks [18-25 years] and 8 other travellers. Persons with disabilities are welcome to join us. The travellers have to be enthusiastic and motivated about the project. They have to feel able to live a group experience and be prepared to have an intercultural exchange. Individual interviews for the travellers to express the issues they want to deal with and the initiatives they would like to see. 5 days of training (theory and workshops) to learn about social innovation, project management, informal learning tools, etc. 21-day-trip in August to permaculture farms, cultural centers, cooperative organisations, etc. Activities: festivals, workshops, debates, concerts, introduction to permaculture and eco-construction, etc. Shared experience: through different supports such as a film realised by young artists, journals, sort-films, photos, expositions and/or happenings. The “Trip to Heterotopia” begins on August the 6th and ends on August, the 27th. From the 06th to the 09th: We’re at Ramonville-Saint-Agne, in Toulouse’ suburbs. We will discover eco-housing and we will take part in different workshops such as eco-building and healthy and responsible food with our partner Slow Food Institute. From the 09th to the 13th: We’re in the Pyrénées mountains at Labastide de Sérou. We’ll participate in workshops about organic farming, eco-housing and and energy saving. We will also visit a farmhouse, cultural bars and cooperative organisations. From the 14th to the 15th: We go to Vieillevigne in a place that borders a channel that links the Atlantic Ocean to the Mediterranean Sea. It is a place to think about a post-industrial society. Those who lead the place experiment eco-building, renewable energies and welcome artists and cultural creatives. From the 16th to the 20th: We will stay in a medieval village (Lautrec) and we will take part in an eco-conscious Music Festival (“Festiv’Août”). We will also visit cultural bars and farmers markets and discover the incredible edible movement. From the 20th to the 25th: We will stay in an eco-village in Ginals. A festival about Transition is foreseen including films projections, debates, workshops about biological farming, self-sufficiency and renewable energies. One day will be specifically dedicated to the Greek situation, culture and initiatives. In addition to the meetings with social entrepreneurs, specific activities will be organized (green building, organic farming, etc). Participants will be trained and will experiment alternative practices that may be useful for them (to take initiative, to understand what green building, energy sufficiency or organic farming means, etc.). Regularly we will encourage them to initiate debates on public places about social issues on which they are interested (food sovereignty, sustainable development, multiculturalism, etc). Beyond these activities, they will experiment community life in an intercultural context and learn from each other in a non-formal way. Daily activities (as cooking), music playing, sport, small games and workshops make cultural dialogue easier. During the trip we will have a bus from the Fair-tourism Committee of Midi-Pyrénées that Via Brachy is part of. This original bus has dry toilets, a solar shower, a windmill, etc. It will be a great tool that would make easier for the group to travel and will help us in our public debates and happenings. We will be accompanied by our partner Slow Food Institute who will guide us through local biodiversity and local cooking. Contact our partner to join!